Visual albedo is the measure of the reflection of solar radiation out of the total solar radiation received by an astronomical body, taking into account only the visible light. The visual albedo of the Earth is 0.37, and the Moon’s is 0.12. The Moon appears darker if the Earth also appears in the same photograph. 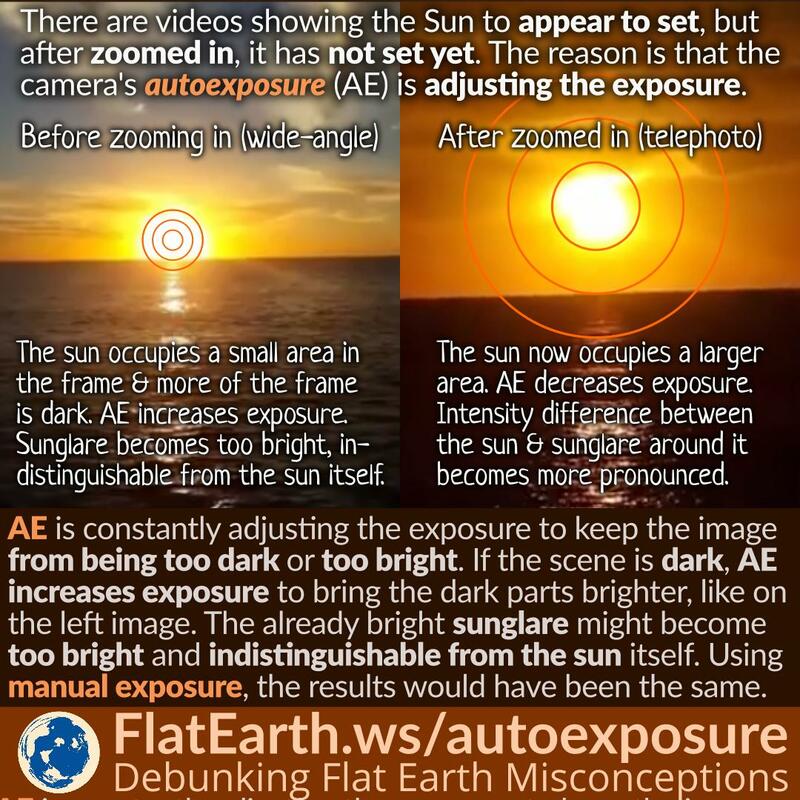 Flat Earthers use the fact to “prove” that the picture is fake. They are wrong. The Moon appears darker because it reflects less sunlight than the Earth. In photography, bokeh is the way a camera lens renders out-of-focus points of lights. The shape of bokeh depends on the camera lens more than the out-of-focus objects themselves. 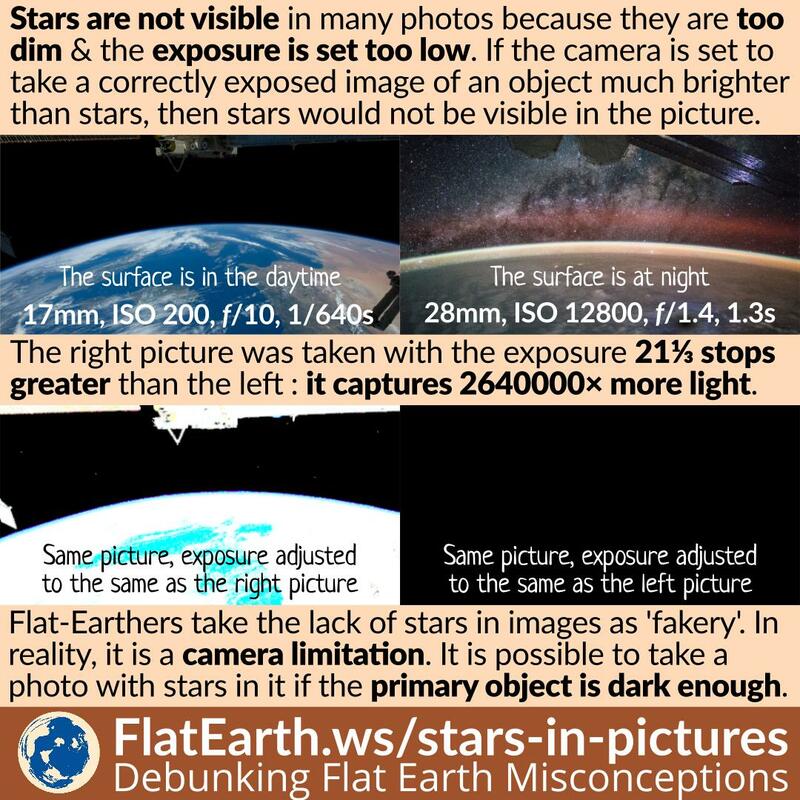 Some flat-Earthers do not know how to take correctly focused pictures of distant planets and stars due to their lack of knowledge and the unsuitability of their camera for the purpose. All they are getting are bokeh, which does not tell us much about the intended objects. How an object appears in a photograph depends on perspective —the position of the camera relative to the object—, and field of view of the camera. The farther the object, the smaller the object will appear in the resulting image; and conversely, the closer the object, the larger it will appear. The narrower the field of view, the larger the object will appear in the image; and conversely the wider the field of view, the smaller the object will appear. 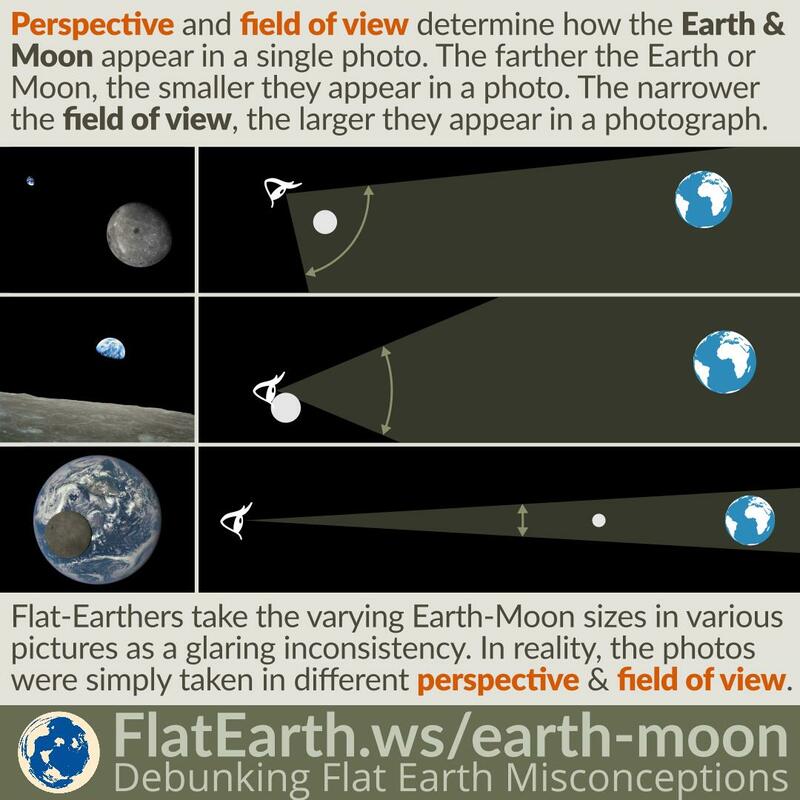 Flat-Earthers take the varying proportions of the Earth & Moon in different pictures as a glaring inconsistency. They are wrong. The pictures were simply taken from a different perspective and field of view. NASA has published several pictures of the Earth that are composites. It means the pictures were the result of combining many images into a single picture. In most cases, the source pictures were taken from low-orbiting satellites to obtain higher resolution pictures of the Earth. 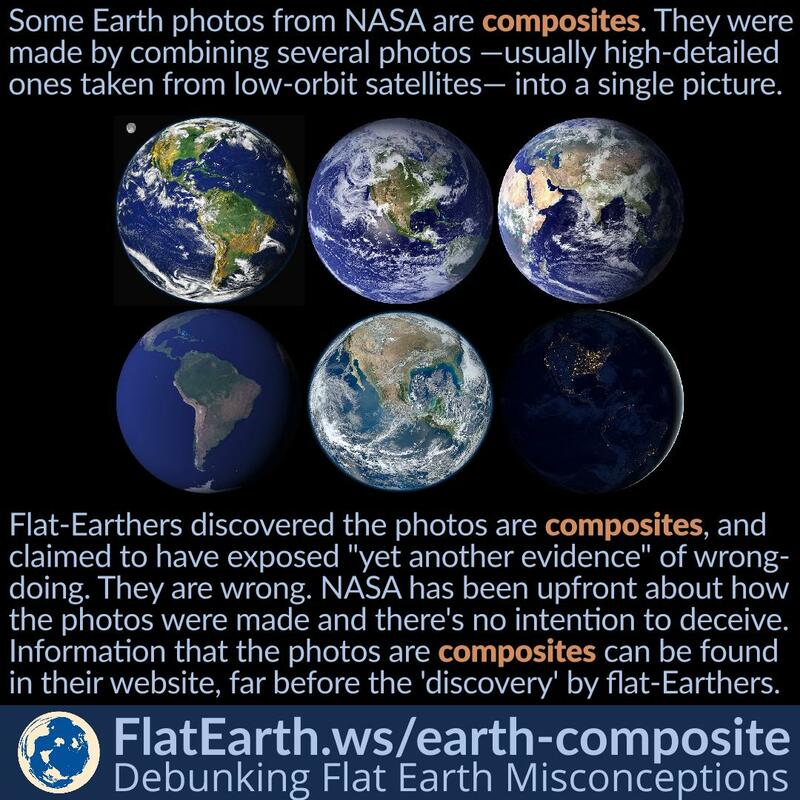 Flat-Earthers discovered the photos are composites and claimed to have exposed “yet another evidence” of wrongdoing. They would publish this “findings” everywhere to turn us emotional. They are wrong. 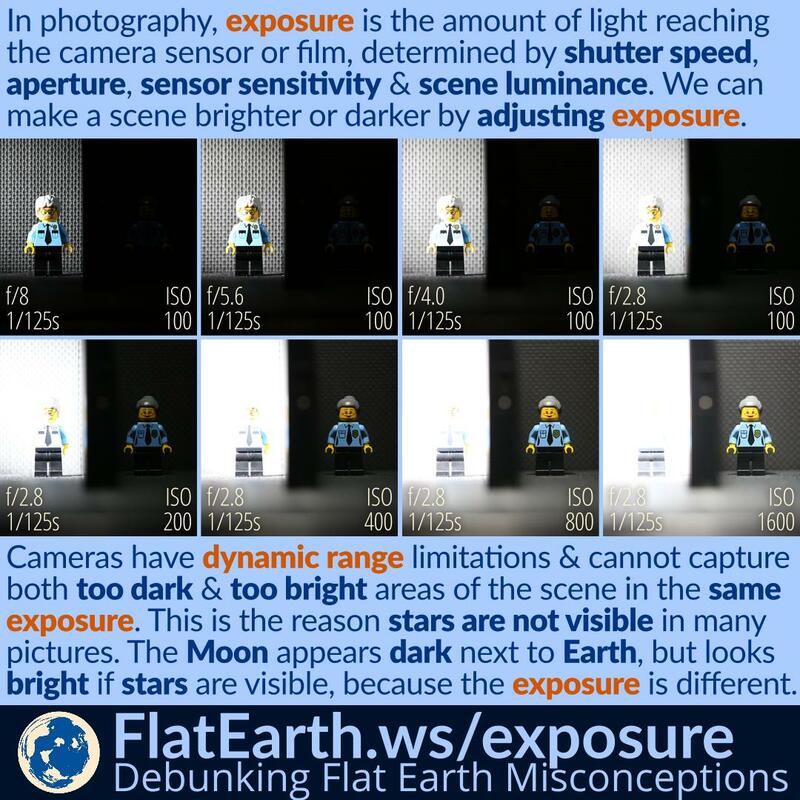 Nobody is covering the fact the pictures are composites, and there is no intention to deceive. Information that the photos are composites can be readily found in NASA’s website, far before the claimed “discovery” by flat-Earthers. In photography, exposure is the amount of light reaching the camera film or sensor, as determined by shutter speed, lens aperture, and scene luminance. By adjusting the exposure and sensor/film sensitivity (ISO), it is possible to get a bright or dark result. It is quite apparent that photography has never been any flat-Earthers’ strongest point. 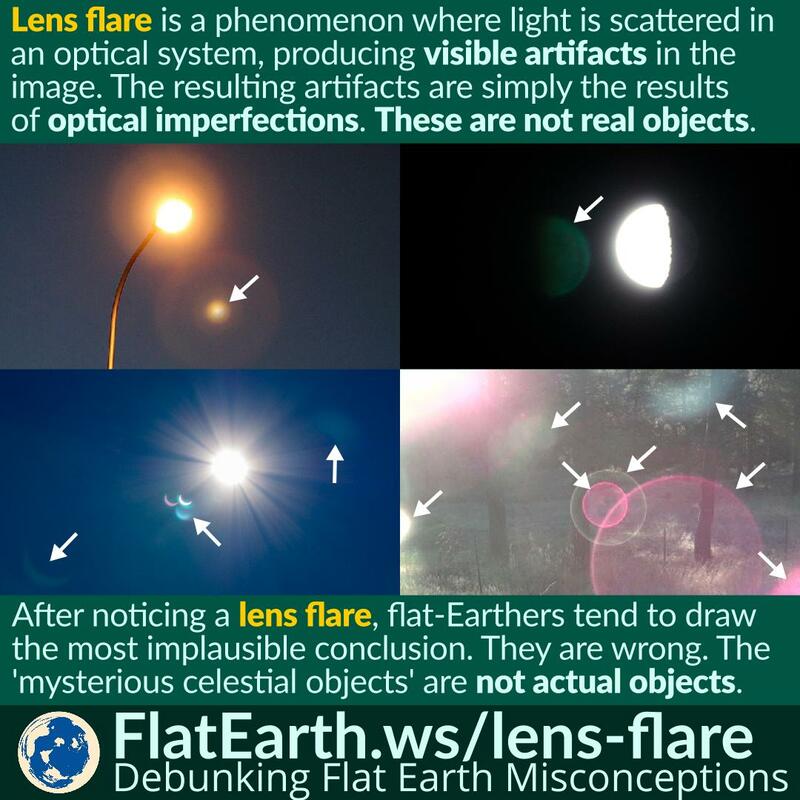 There are many misconceptions in flat-Earth circles that arise from their ignorance about photography. One of such misconceptions is exposure. The amount of Earth’s surface we can see at once from a location in space depends on our distance to the Earth. The closer the observer, the smaller the amount of visible Earth’s surface. Conversely, the farther the observer, the larger the amount of Earth’s surface visible to them. But no matter how far the observer, they would not be able to see the entire hemisphere. Flat-Earthers discovered that there are the differences in the sizes of continents in the different images of the Earth, and used the fact as ‘evidence’ of misconduct. They are wrong. Such differences in continent sizes are present because the images show the Earth from different distances and different field of view. In some photographs of the Moon, there are bright spots in the dark part of the Moon. Some flat-earthers believe that these are ‘stars’, and the Moon is actually transparent. These are in fact image noise, not stars. The surface of the Earth close to the equator is moving at the speed of about 1670 km/h due to Earth’s rotation. To take a sharp picture of the Earth with the resolution of 10000×10000 from a stationary position in space, it would require the shutter speed faster than 2.7 seconds. It is not difficult at all to take a sharp picture of the entire Earth without perceivable motion blur. 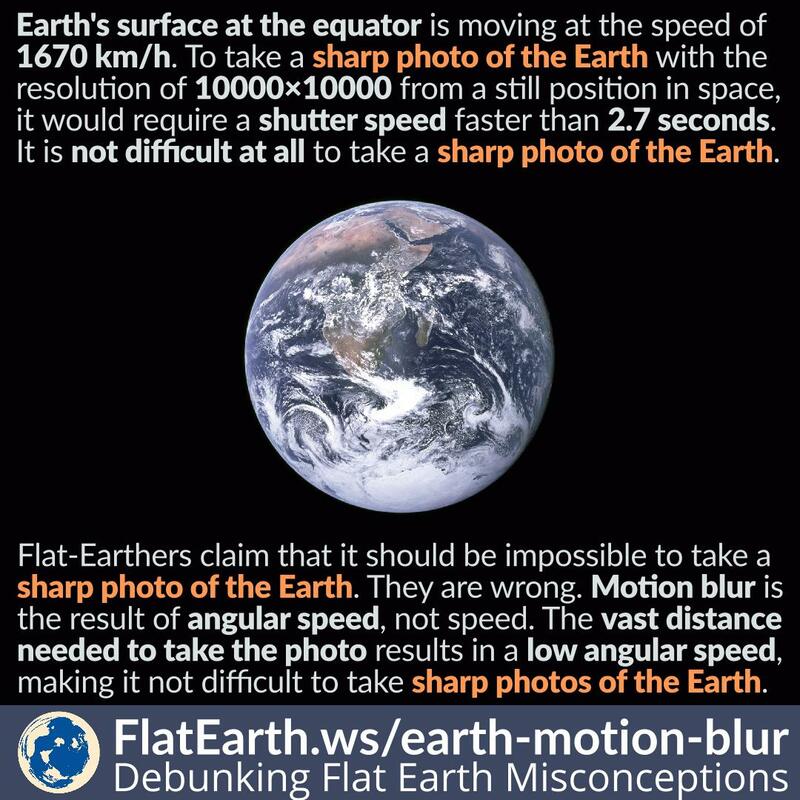 Flat-Earthers claim that it should be impossible to take a sharp picture of the Earth from space due to the speed of Earth’s rotation. To them, the fact that a photographer cannot take a sharp photo of a speeding race car from the sidelines (they actually can) tells us it should be impossible to take a sharp picture of the Earth moving at 10× the speed. They are wrong. Motion blur is caused by the angular speed of the object relative to the camera, not from its absolute speed. The vast distance required to take a photo of the Earth results in a very low angular speed, making it not difficult at all to take sharp images of the Earth. If we were to magnify the surface of any spherical object with large enough magnification, then at some point, it would appear flat. This can be easily demonstrated using a macro lens as the Redditor ‘Useless-Pickles’ did. He magnified the surface of a basketball using an extreme macro lens as a philosophical demonstration. This shows that the surface of a spherical object can easily look flat if the object is large enough, or the observer is small enough. And the basis of all flat-Earthers’ belief that the horizon appears flat is insufficient to determine the shape of the Earth. 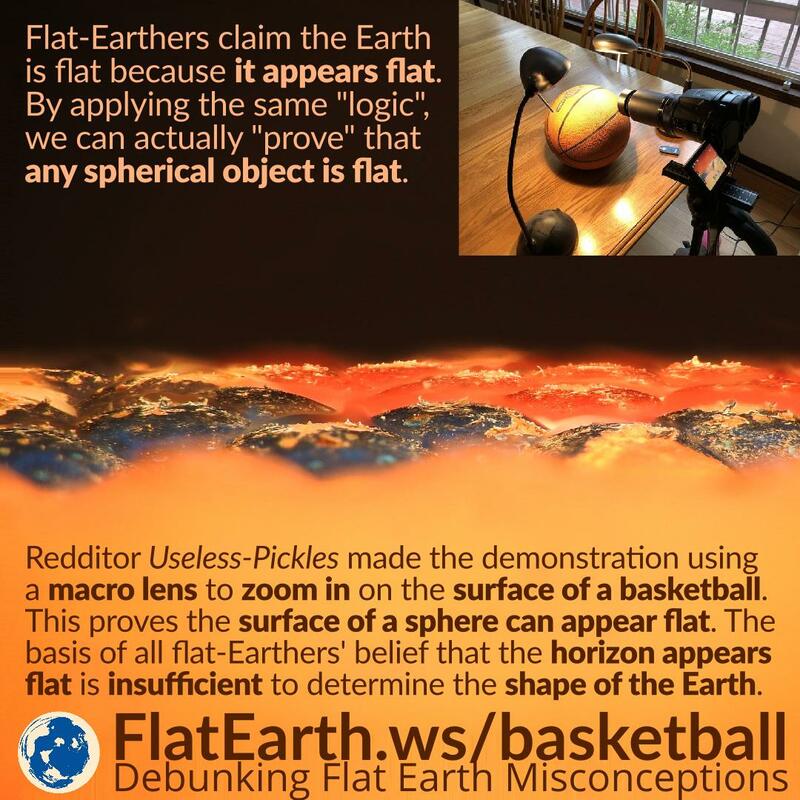 By applying the same “logic” as these flat-Earthers, we can actually “prove” a basketball is flat, which, as we all know, is clearly wrong. A photograph of an object does not necessarily look the same as the real object. There are various optical imperfections, which are impossible to avoid by both the designer of the optical system and the photographer taking the picture. One of those imperfections causes lens flare. Some flat-Earthers noticed the existence of a ‘mysterious celestial body’ next to a photograph of the Sun or the Moon. They would use such sightings to ‘explain’ various celestial phenomena which cannot be readily explained in the flat Earth model, like eclipses. They are wrong. The ‘mysterious celestial body’ was merely a lens flare. The first photo showing the entire Earth was taken in 1966 from the spacecraft Lunar Orbiter 1. Since then, there are too many photos showing the whole earth taken from various missions to space. The advent of computers in the 80s introduced a new technique of generating such pictures. A satellite can be used to take many photos of the Earth from a low orbit, and computers can be used to assemble those pictures into a single photo of the Earth. 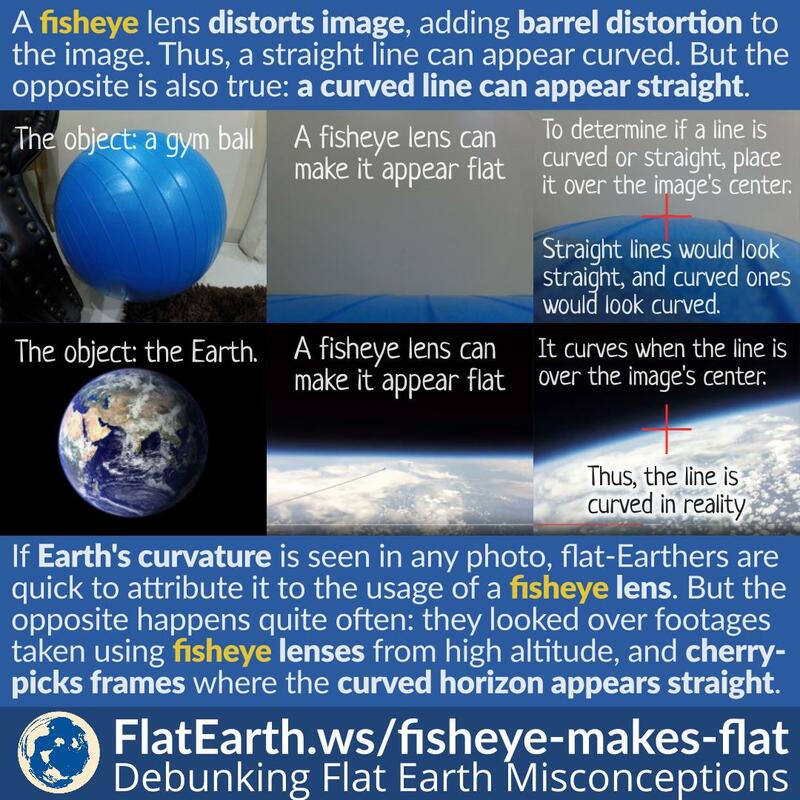 Flat-Earthers ‘discovered’ such technique, then they concluded that all pictures of the Earth taken from space are all composites, the results of manipulation or assembled by computers. They are wrong. 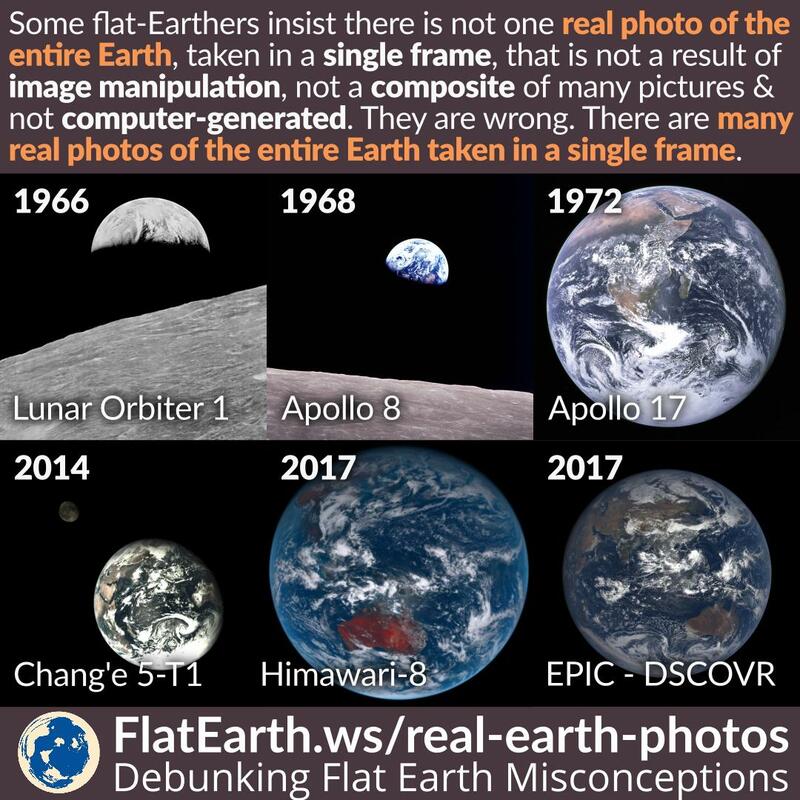 Just because there were pictures created using such technique, it doesn’t mean there is no genuine picture showing the entire Earth, not composites, not stitched, and were taken from a single shot. 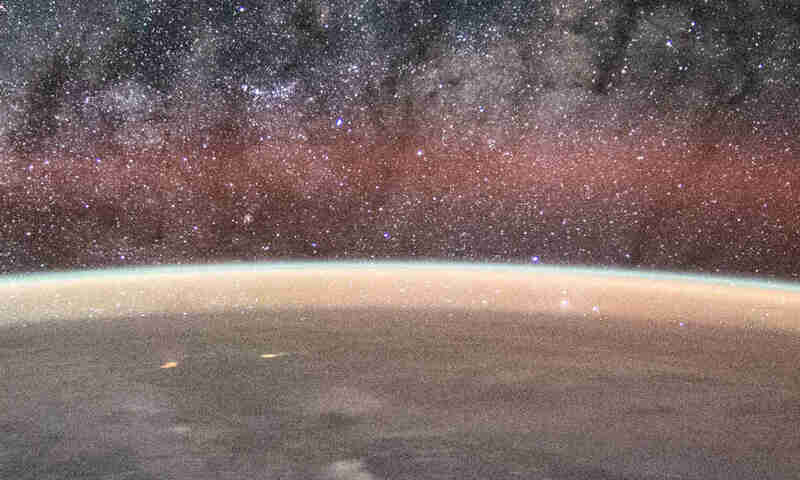 In many pictures taken from space, stars are not visible, even with a dark sky. The reason is that stars are very dim compared to the primary object in the pictures. If the camera is set to take a correctly exposed image of an object that is much brighter than the stars, then the stars would not be visible in the picture. The same thing would happen everywhere, in space, or on the surface of the Earth. Flat-Earthers often take the lack of stars as fakery. They are wrong. This is simply a limitation of any camera. The Sun has the angular size of approximately 0.53° seen from Earth, and it is practically constant throughout a single day. But sunlight is very intense and result in a glare that surrounds the Sun. Because of the intensity, we are unable to distinguish the Sun from its glare. During a sunset, the intensity of sunlight is lower due to the fact that sunlight has to traverse Earth’s atmosphere at an angle. Because of the reduced intensity, the amount of glare will also be reduced, and the Sun can look as if it is shrinking. 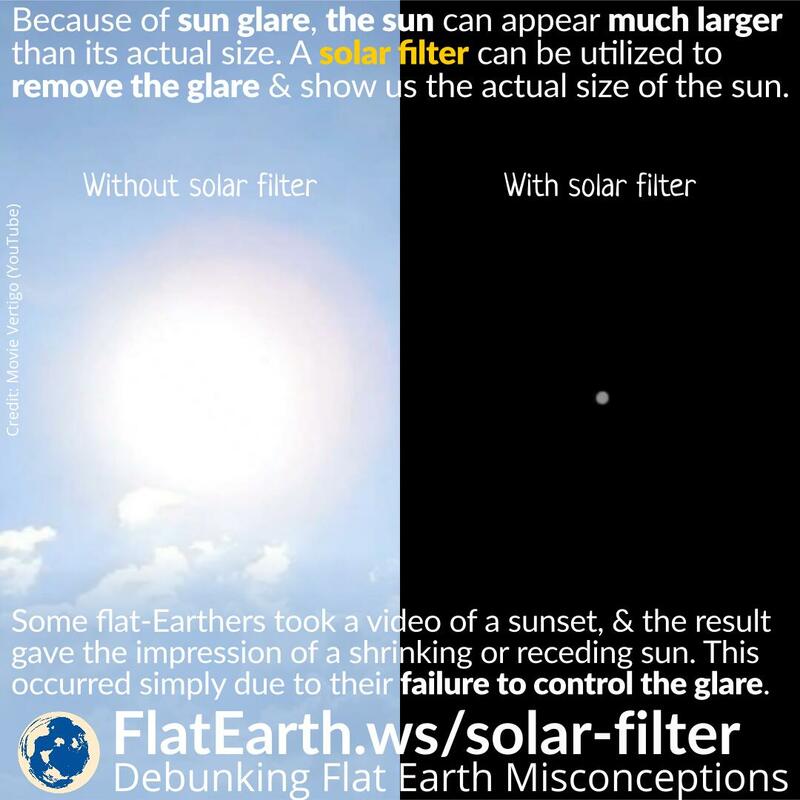 Flat-Earthers often use this phenomenon as ‘evidence’ of a receding Sun during a sunset. They are wrong.